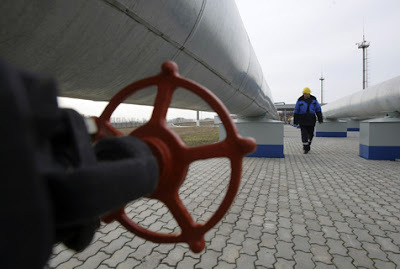 KIEV, Ukraine -- Ukraine's new government is close to completing work on a bill that would let Gazprom and European Union companies join the country in operating its vast gas pipeline network, Ukrainian Deputy Prime Minister Andriy Kluyev said Friday. The announcement could lead to a breakthrough in gas supply negotiations between Moscow and Kiev, which have been fraught with disputes in recent years, including two that disrupted supplies to Europe. Ukraine wants cheaper gas to take the burden off its reeling economy and deficit budget, and offering partial control of the nation's gas pipelines is one of Kiev's strongest bargaining chips with Moscow. He said state energy company Naftogaz Ukrainy would have to pay the bulk of the country's gas bill for March, with the budget contributing a "maximum of 10 percent." He said earlier in the week that the bill would be $700 million, or 15 percent higher than in February. Later this week, Ukranian Fuel and Energy Minister Yuri Boiko is to hold talks on the gas trade with his Russian colleagues. Ukraine's government is facing the painful prospect of having to cut spending by 20 percent in the next four months, compared with the same period a year earlier, largely because of the huge bill it will receive for gas imports, Citigroup said in a note to investors Friday. The quick drafting of the bill — in less than a month since President Viktor Yanukovych took office — may be a sign of how desperately Ukraine needs to cut a deal. Kiev's current supply contract was negotiated by former Prime Minister Yulia Tymoshenko, who lost to Yanukovych in a tight presidential vote last month and has bitterly opposed the consortium plan as a threat to Ukraine's national interests. Yanukovych is moving quickly to reach a deal because of the fleeting nature of coalitions in Ukraine's parliament, where supporters of the new president now enjoy a majority, said Pavel Baev, a professor at Norway's International Peace Research Institute. Ukraine inherited a law from the previous Orange government that bans the lease or sale of the gas transit system to foreigners. The legislation blocked earlier talks on Gazprom and EU involvement in running the pipelines in exchange for investment to maintain them. Kluyev said Friday that Ukraine would retain ownership of the pipelines, handing them over to the consortium as a concession. On the campaign trail, Yanukovych proposed reviving the talks to create a consortium of national energy company Naftogaz Ukrainy, Gazprom and EU energy companies. After Yanukovych traveled to Moscow earlier this month, Energy Minister Sergei Shmatko said Russia never dropped the idea of forming a consortium. State-run Gazprom, Russia's gas export monopoly, sends 80 percent of its exports to the EU through Ukraine. Kiev now pays an EU-level price of $305 per 1,000 cubic meters of gas, which experts there say is much more than the rate Gazprom charges other, more distant customers in Europe. Analysts said the deal could look excessive now that Russia has committed to building a huge undersea pipeline to bypass Ukraine. Baev said participation in the proposed consortium and building the South Stream link beneath the Black Sea were mutually exclusive, adding that investment in the Ukrainian route was cheaper and therefore, more attractive. Gazprom could recoup its investment to upgrade the overland pipelines fairly quickly by taking a share of transit payments that it makes for its exports, he said. Western companies' involvement would guarantee that the deal is fair and shielded from the whims of Ukraine's domestic politics, he said. An upgraded Ukrainian pipeline system would have the capacity to handle as much gas as Russia might need to sell abroad if demand rises in the future, he said. A Gazprom spokesman said the company would not comment on the talks before they start. Naftogaz referred inquiries to Ukraine's Fuel and Energy Ministry. Calls to the ministry's press office went unanswered Friday. A spokesman for the Russian Energy Ministry said he was unaware of the delegation. EU Energy Commissioner Guenther Oettinger has said EU companies would be inclined to join the consortium, although he said the pipelines would require a large amount of investment. "There must be a constructive debate about what needs to be done and who needs to do it," he said in an interview to Reuters last week. President Dmitry Medvedev is scheduled to visit Kiev on May 17 to 18, his first visit there as president, which analysts say could bring further progress in the gas trade talks.